Before we came up here to Yellowstone I made sure to download as many podcasts as possible. There are several podcasts I regularly listen to including The Nerdist Podcast hosted by Chris Hardwick and How to Be Amazing hosted by Micheal Ian Black. Those two podcasts might be somewhat responsible for getting me into a mindset where I considered living in Yellowstone for a summer to be an excellent life choice. Another podcast I like is Baconsale. That one focuses on fun, trivial subjects like ranking all the best live action Disney movies. My absolute favorite podcast is the Radio Ronin Podcast. I've been listening to the hosts, Jimmy Chunga and Kenny D, for almost 6 years and they are something like the longest (albeit one-sided) friendship I've had during that time. Jimmy Chunga, often talks about his love of Disneyland. He likes to say that every person who visits Disneyland is celebrating a personal victory just by being there. He knows the effort they've gone through to save up the money and plan the trip and in his eyes they are victors when they walk through the gates. Every day I feel like I'm celebrating a victory by being in the park. I get to walk through the woods on my way to work. I get to watch people enjoy their vacations on my lunch breaks. I get to walk through another section of woods as part of my job. And when I'm done with work I have a whole National Park to explore with my family. Every day I'm so amazed that this is really my life. Today I want to talk about some other personal victories that have occurred in the past few weeks. Victory Number 1: I got a promotion! My department had two openings for the position above mine. My co-worker and I applied and after a couple agonizing weeks we finally found out the results. 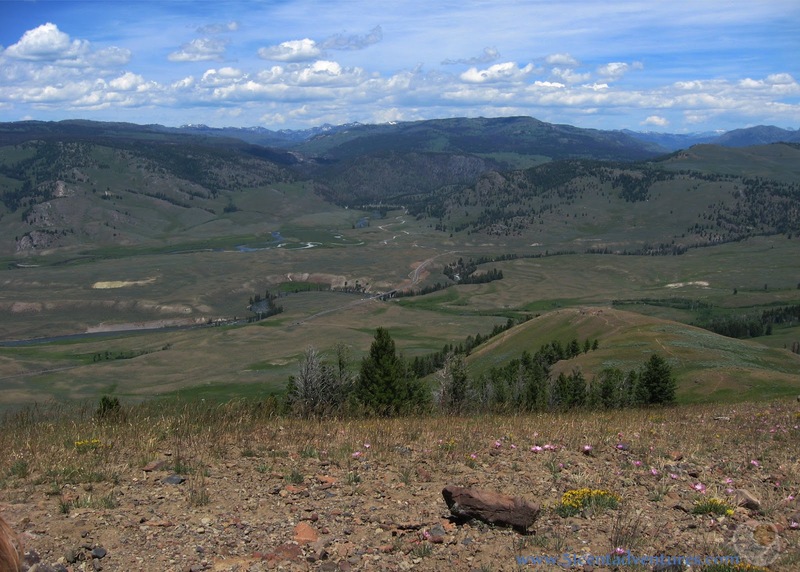 My co-worker got the job in our office, and I was offered the position at another location in Yellowstone. I'm pretty excited about the promotion. The only problem is that my boss hasn't found anyone to replace me. So I haven't been able to start at my new location yet. But hopefully I'll be there within the next week. Victory Number 2: My husband has been called to lead a church service for Canyon Village. We belong to the Church of Jesus Christ of Latter Day Saints which holds Sacrament Meeting services in four different locations throughout Yellowstone. 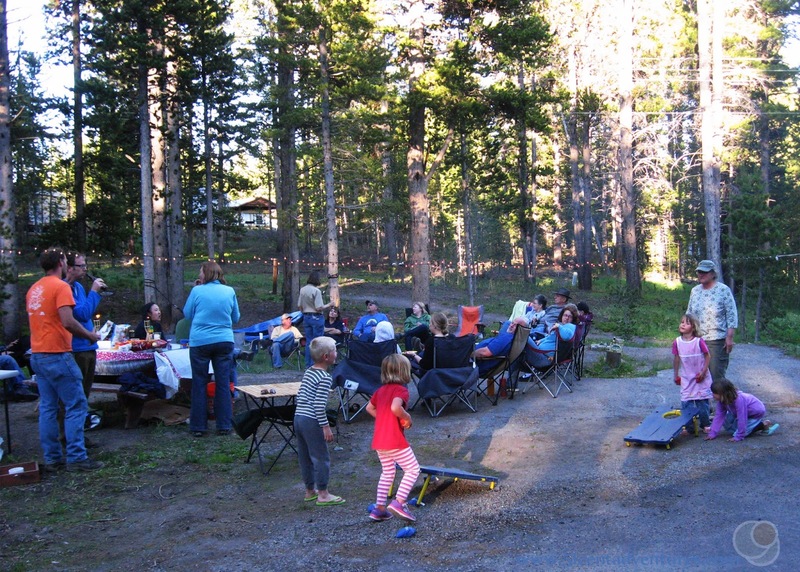 The meeting are held at Old Faithful, Grant Village, Lake Village, and Canyon Village. This is a big responsibility and my husband is honored to have been chosen. Victory Number 3: Our youngest daughter is FINALLY potty trained (mostly). She'll be four in September and we've been working with her for months to get her potty trained. You'd think that after potty training her three older siblings we'd know what we were doing, but that wasn't the case. With the older kids we just had to find the right motivation. (Candy for the twins, mini marshmallows and train rides for the boy) But this little girl isn't externally motivated AT ALL. She didn't care about any of the incentives we offered her. Victory Number 4: Our Honda is registered for another year. This was quite the headache for several months. Our Alabama licence plates expired at the end of June, but we aren't planning to have our next home in Idaho until August 1st at the earliest. 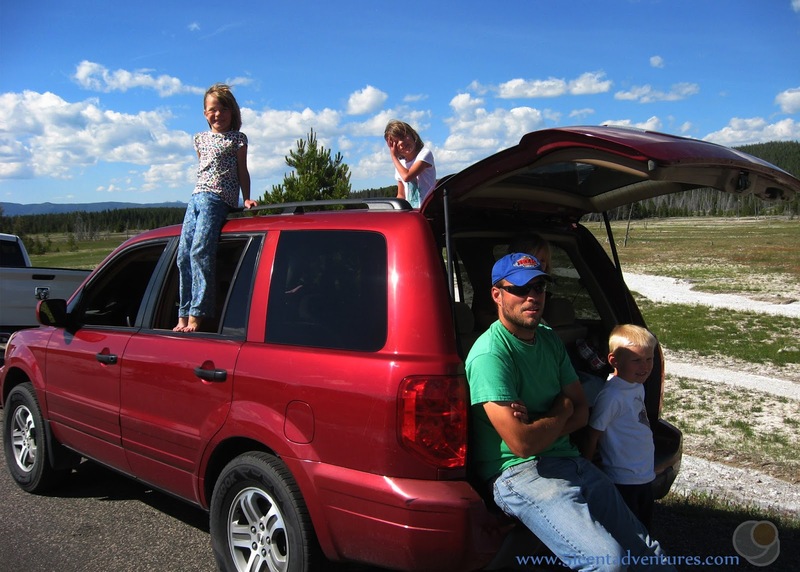 We went through several different plans for how to have a registered vehicle during July. Registering it in Wyoming was the easiest option. So now we have Wyoming plates to add to our collection. Some people collect state quarters - I collect state licence plates. Victory Number 5: Our kids have learned how to sleep in. I didn't know it was possible for all four of them to sleep in passed 7:00 am, but lately they have been sleeping in until 8:30. It's heaven to wake up before the kids. The trade-off is that they stay up until about 9:00 to 10:00 each night, but I can live with that. 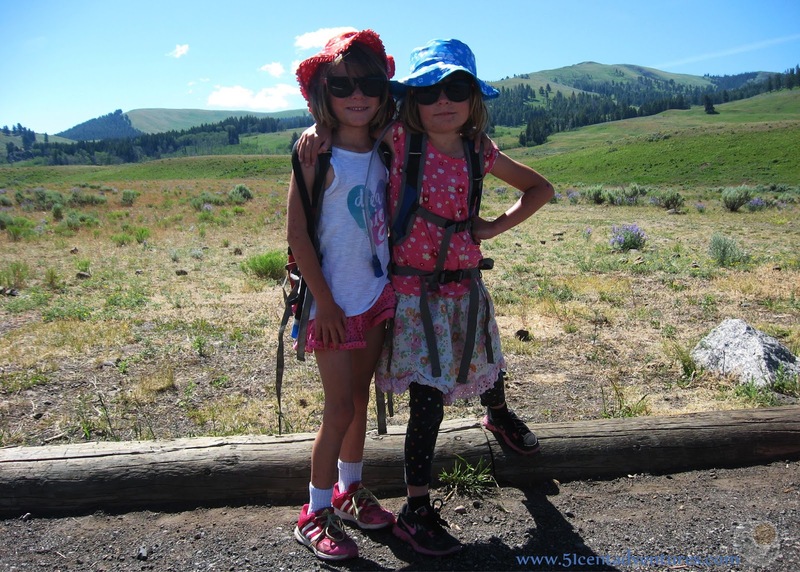 Victory Number 6: We are almost halfway through this summer and we are still loving it here in Yellowstone National Park. I'm so glad that our crazy plan to live in an RV has panned out so well. This is definitely a summer to remember. So lets take a look at some pictures from the last few weeks. This first one is proof that we are still loving our time here. Look at those smiling faces. This picture was taken halfway thought a pretty grueling hike to some petrified trees (more on that later), but we were all pretty excited to be doing something so fun as a family. One of my favorite things about working in a National Park is that it's really easy to go play after work. I get done with work around 5:00. My husband has dinner ready by the time I get home (because he's amazing that way.) and then by 6:00 we are ready to go explore. 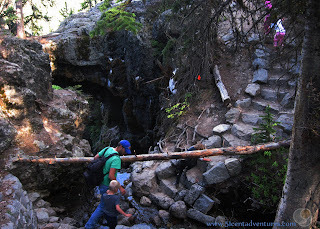 One night we decided to hike to Natural Bridge. This hike is usually closed until mid June because bears frequent the area. I checked with the park service and they said the trail was open. So we headed out there. I've seen several pictures of the Natural Bridge, but I never realized that you could hike up behind the bridge. So instead of showing you a picture of the bridge, here is a picture of the little ravine behind the bridge. It was very pretty. Another night my husband and kids picked me up from work and we drove into the Lamar valley to do some evening wildlife spotting. 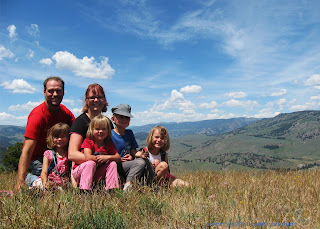 We saw a moose with it's baby as well as a whole herd of pronghorn. 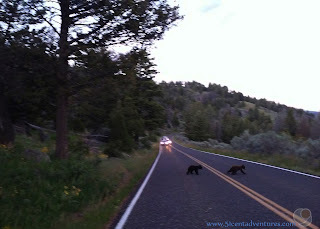 But the highlight of the night was the Mama Bear with her two cubs. They were on the side of the road and we watched them play as they walked right by our car. Then they crossed the road behind us. 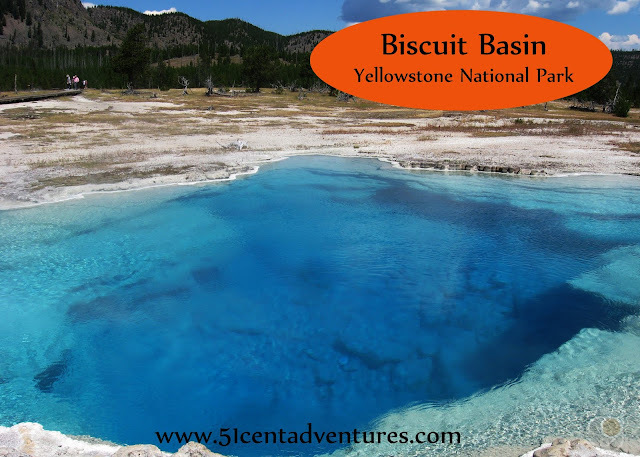 We've wanted to get up early and go to the Old Faithful area and hike from Old Faithful all the way to the Biscuit Basin and back. Well, the kids ended up sleeping in the day that we'd planned to do that. And we weren't messing with sleeping in. So we didn't get on the road until later than we had planned. The day was pretty warm and I knew we didn't have enough water to make it all the way to the Biscuit Basin. So instead we did about half the hike. Still it was really cool to see lots of geysers and pools that I've never seen before. 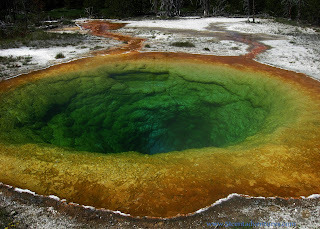 At the end of the trail we were rewarded with the beautiful Morning Glory Pool. We went through the Hayden Valley on our way back from Old Faithful. We ended up getting stuck in a "bison jam." The bison were using the bridge to cross the water. It took about 30 minutes for us to get across the bridge. 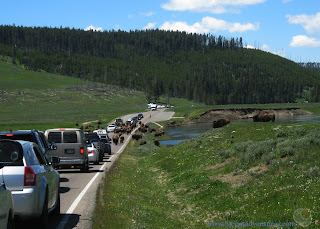 This is a pretty common traffic problem in various parts of Yellowstone. 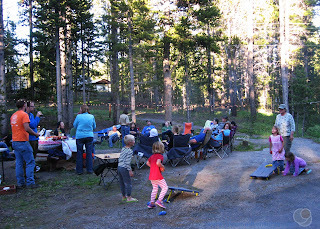 Our campground had a block party for all the residents. It was put together by one of the ladies who works for the post office. (If you think about it, it makes sense that she would be the most popular person in the area.) There were employees from Xanterra (that's who I work for), Delaware North (they do the General Stores), and the National Park Service (they do everything else). We had the only kids there. They had fun with the games that the post office lady brought. Yellowstone is very different from the "real world". One of the biggest differences is that in Yellowstone having a trailer/RV is seen as a mark that you really having your life together. Most employees live in dormitories so having an RV is a big deal. My sister came to visit us all the way from Texas. 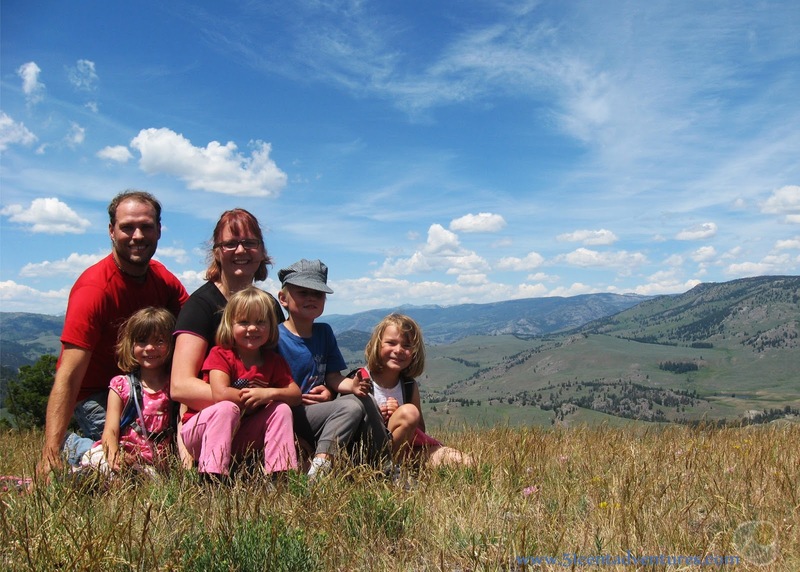 Her in-laws have a time share near Yellowstone and they talked her into joining them this year. We got together on my day off. 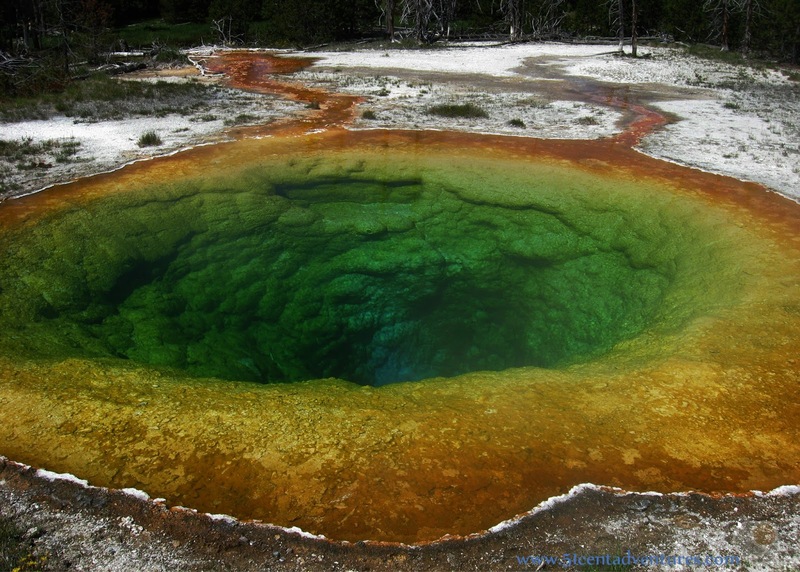 She told me, "I'm here to see you, not Yellowstone." So we didn't do a lot of sight seeing. Instead we got ice cream at Canyon Village and later went down to the beach at Fishing Bridge. While we were there we saw a Bald Eagle Fly overhead. We were only planning on seeing each other that one day. But instead we found ways to see each other two more times. One night she surprised me at my RV. And other time we went out to the condo for the evening. (And I got to use normal speed internet to rebuild my supply of podcasts.) She has two little boys and a new baby girl. My kids loved spending time with their cousins. And I was happy to hold the baby. This was actually another sort of personal victory. 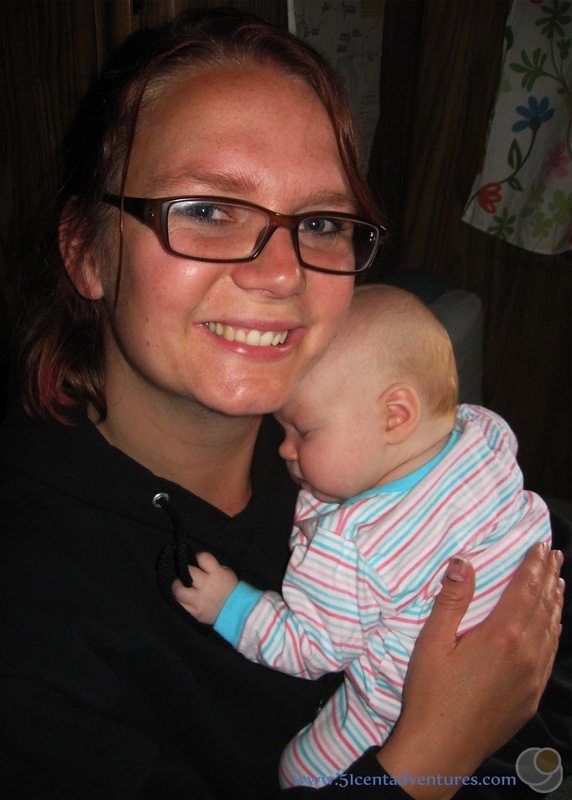 Since I had my kids so close together I got really overwhelmed with babies. I really haven't wanted to hold many babies since my youngest. I'm glad I'm back to liking babies again. 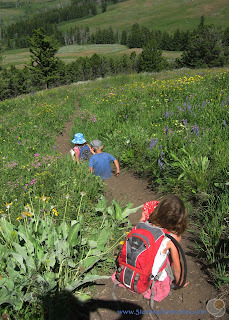 Most of the snow has melted from most of the trails so we can plan some hiking trips without ending up covered in mud. On one of my days off we decided to hike to Lone Star Geyser. This geyser is about 3 miles from Old Faithful. The trail is 4.7 miles round trip and is mostly flat. 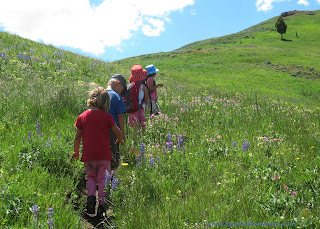 This was the longest hike the kids have been on, but they did great. 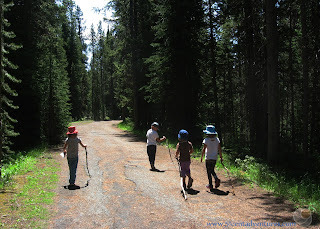 When we hike the kids like to drag sticks behind them. Here they are all doing that. 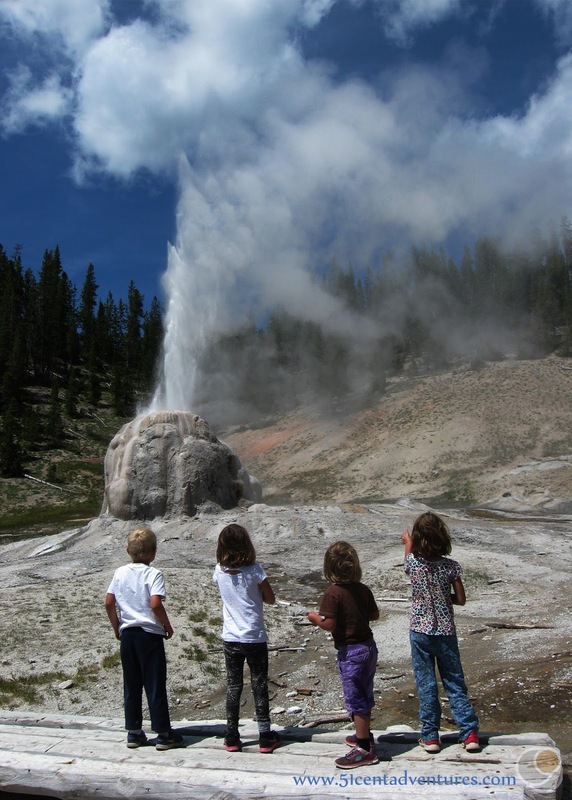 Lone Star Geyser erupts about every 3 hours. When we got there we had about a 45-60 minute wait until it erupted. It was pretty cool to watch it go off. It erupted for about 15 to 20 minutes. We all really liked it. 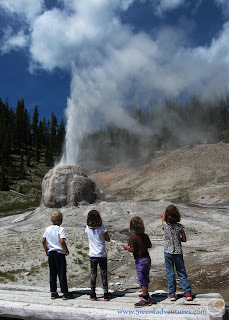 My kids thought it was called "Lonely Geyser." and they decided to rename it Friendly Geyser because it put on such a good show for everyone who came to see it erupt. 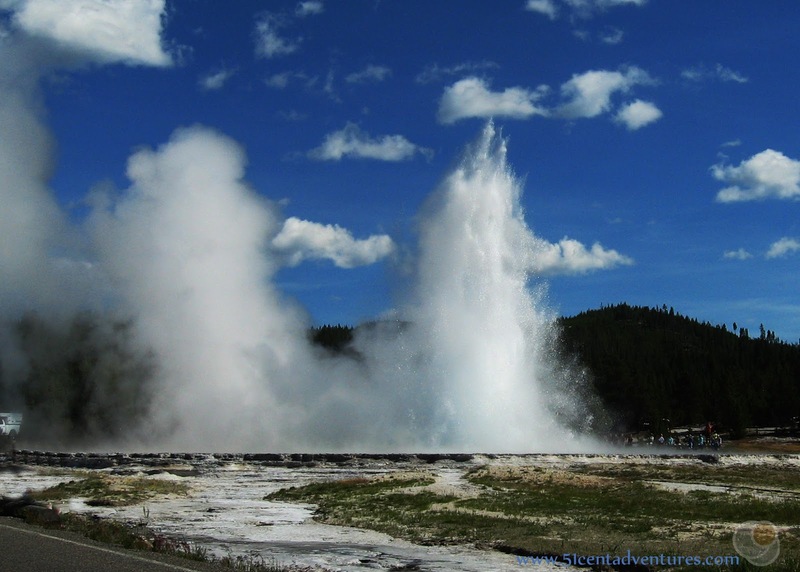 On our way back home we drove by the road that leads to Great Fountain Geyser. On a lark I told my husband that we should drive down there and see if it was going to erupt soon. Some of the more consistent geysers have signs near them that give a prediction window. When we got near the sign it said that the geyser was scheduled to erupt some time between something like 2:00 pm and 5:15 pm. It was 4:50 and there was a huge crowd of people and cars around the geyser. We liked the odds of seeing this geyser so we found a parking spot and sat back to wait. There were benches near the geyser, but they were in the sun. 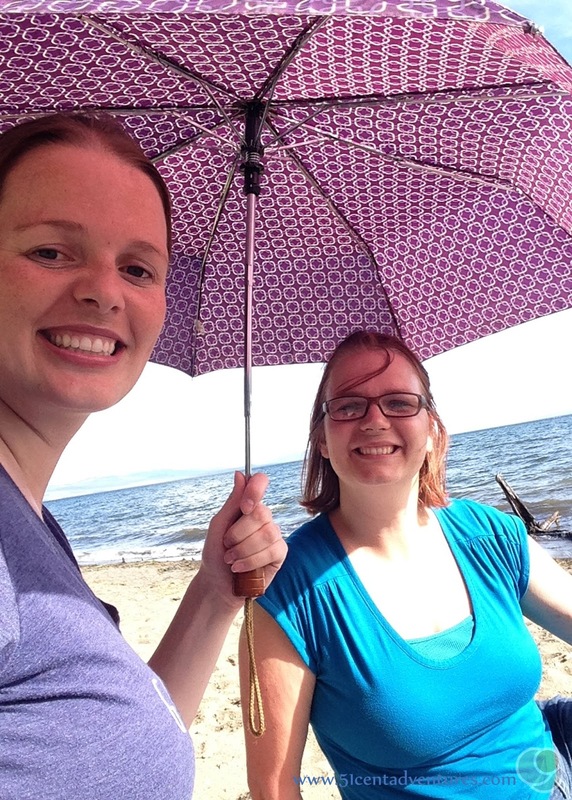 We preferred to wait in the shade of our car. We didn't have long to wait. Within 5 minutes the water started churning and sending up small shoots of water. Soon huge pillars of water were shooting into the air. It was amazing. Just when we thought the geyser was done it would shoot up even taller pillars of water. I've decided that this is my favorite geyser in the whole park. 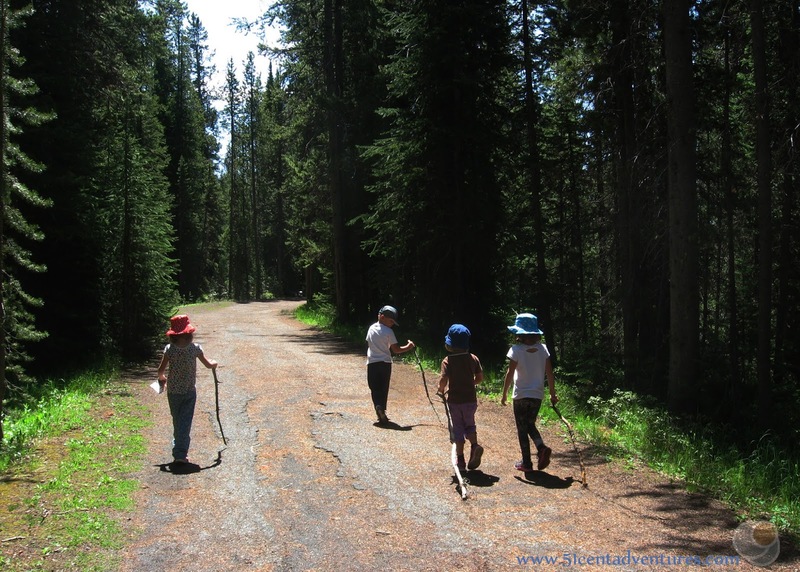 Our hike to Lone Star Geyser had gone so well that that the next day we decided to go on another long hike. 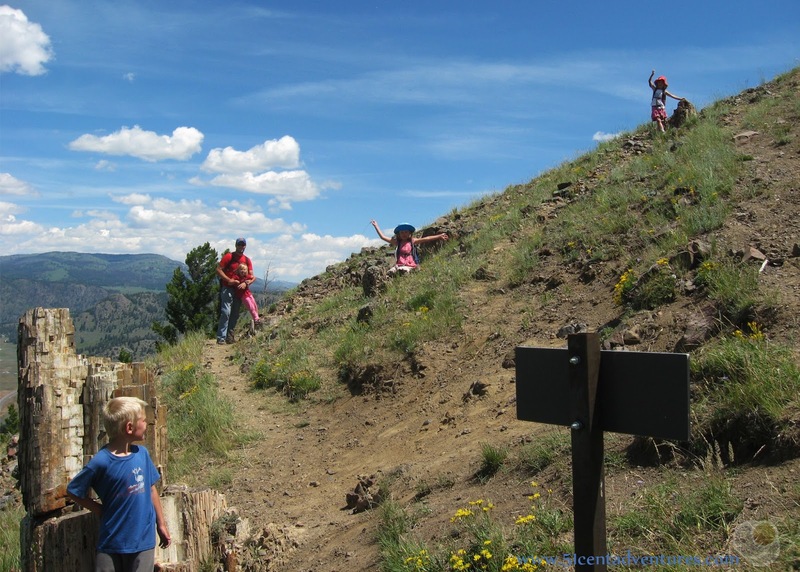 We want to hike to the summit of Mt Washburn sometime this summer, but that's a seven mile hike. 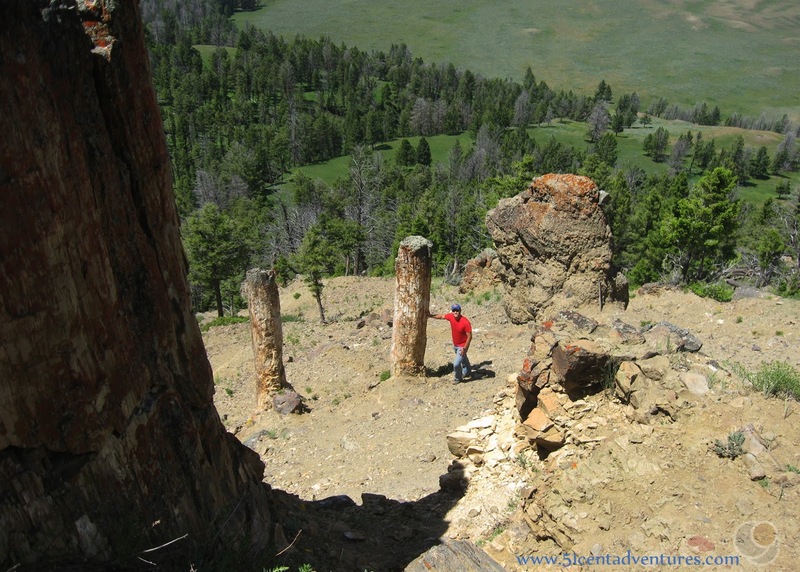 I wasn't sure if we were ready for that yet so I picked a shorter hike: The 3 mile hike to the Petrified Trees. Here are the twins posing at the trail head. This is one of my all time favorite pictures of them together. The book said: "There are a number of fossil forests in Yellowstone and a number of trails that will take you to them This is one of the shortest most direct routes." What I didn't realize is that in this case "most direct" was code for STEEP. The trail started out level, but gradually it got steeper, and steeper, and steeper. This trail definitely needed some switch backs. But instead it just went straight up a ridge. If it wasn't for the promise of petrified trees at the top I would have turned around. But we kept going. Eventually we started finding petrified tree stumps. We considered ourselves rewarded when we came to an area that had 4 stumps within a short distance of each other. I had each of the kids stand by a stump so they would be easy to point out in this picture. Part of me was thinking that we'd seen all there was to see with these four trees, but my husband wanted to hike to the top of the ridge. 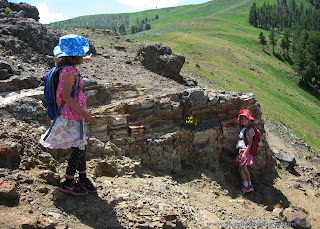 We scrambled over loose stones and climbed to the top where we discovered a HUGE petrified log. The big tree was quite the sight. According to the guide book it was 26 feet in circumference. It was a Redwood tree that lived 50 million years ago. I like the juxtaposition between my three year old and something that was 50 million years old. And that's not all. There were two tall and skinny stumps located below the tree. The hike had been grueling, but it had definitely been worth it. 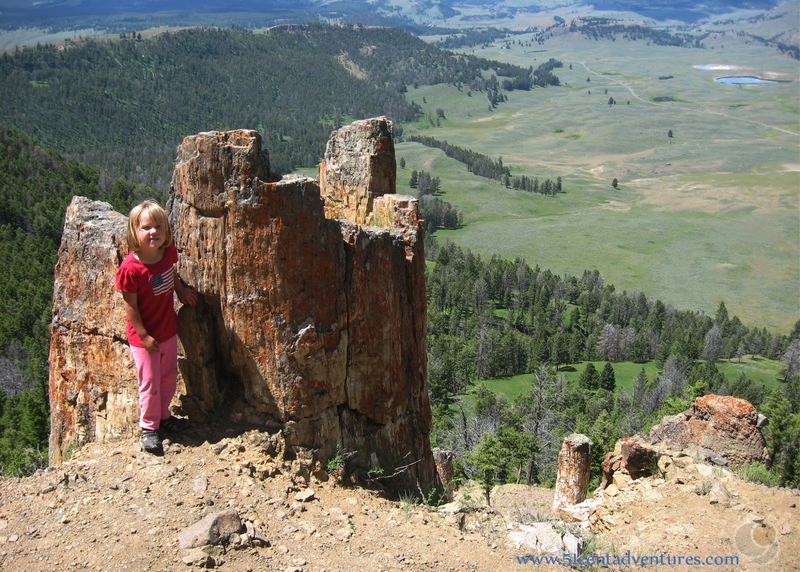 Most visitors to Yellowstone only see the petrified tree that is near the north section of the Grand Loop Road. Very few see these trees. We hiked up one last steep trail and came out almost at the top of the mountain. This is our view while we ate lunch. Quite the sight. You can just barely make out our car down below. As we'd hiked we'd seen several other hikers attempt the climb. A few people made it to the big log, but none went beyond that point. We congratulated our kids on being tough little hikers. The trail had gained 1500 feet over the course of 1.5 miles. Whew! Getting down was actually harder than going up. We had to be really careful with our footing. The kids found it easier to slide down on their bums most of the time. My husband and I did that a few times too. (And a few were actually planned.) By the time we got back to the car my toes hurt so bad from being squished into the tips of my shoes. I do not recommend the hike to the petrified trees to everyone. It is definitely rigorous, but if you think you have the stamina, it is definitely worth it. And I'm almost ready to say that Mt. Washburn with its many switch backs is going to be a cake walk compared to the petrified trees trail. It took us several days to recover from the hike. I was actually happy to go back to work the next day because it meant I could rest. By July 4th though, we were ready for more fun. We had several options for where we could go to celebrate Independence Day. 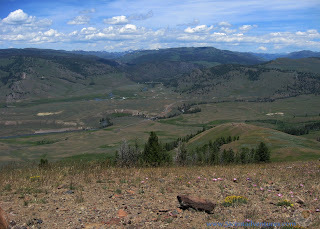 We could have driven south to Jackson, north to Gardiner, east to Cody, or west to West Yellowstone. Jackson seemed like it would be the overly-crowded, and Cody and Gardiner would require driving back over mountain passes in the dark. So West won out. I had to work that day so we decided to just head out over there after dinner. So we arrived in West at about 7:30. Now before I go any further I need to tell you about the last two Fourth of July celebrations we've been to. We celebrated the fourth on Fort Rucker Alabama. They had a really good cover band play for 2 hours before the show. They always encored with Sweet Home Alabama and let me tell you, there is nothing like hearing Sweet Home Alabama played live in Alabama. I just wasn't sure this year's celebration could ever live up to that. But then I started to have some pretty good signs that it might. First, the live band that was playing in West was named Slamabama and they were from Birmingham, Alabama. I was pretty certain there was a good chance they would play Sweet Home Alabama. When we arrived at the city park in West Yellowstone the Granite Youth Orchestra was playing for the crowd. I grew up in the Granite School District in Utah and my dad, my brother, and a few other relatives had been in this Orchestra, and I'd been in the Jr high version of this orchestra. So it was fun to see them. After the Orchestra was done, Slamabama took the stage. At first they only played country songs, but they started doing other genres as the night went on. They encouraged everyone to come up right near the stage and form a mosh pit of sorts. The twins wanted to go up front so we went up there and danced at the edge of the crowd. The band played Uptown Funk which we call the "Fourth of July Song" because the kids liked dancing to it at the Fourth of July celebration 2 years ago. And then the guitarist played the opening notes to Sweet Home Alabama and my girls and I screamed with happiness. The energy of that band and that crowd made this the best version of Sweet Home Alabama I've ever heard. It definitely made my night to hear that song. No matter where I live, a little piece of me will always consider Alabama as my home. The band played other songs, but we went back to our picnic blanket and pulled out the glow sticks that my husband had been sure to buy at a dollar store several weeks ago. (We come prepared to these things.) Fireworks were scheduled to start at 10:15, but the state of Montana has some pretty lax firework regulations and so there were unofficial aerial shows going off all around us for most of the night. The official show started and my husband took the twins to get a good look at that. I stayed at the picnic blanket with the other two kids who were pretty freaked out by all the loud notices. I decided that live bands are my preferred way to celebrate Independence Day. Fireworks are kind of a little bonus at the end. The show ended and we made our way back to the car. There was a huge line of cars heading west from West Yellowstone, but there were only a few cars heading east back into the park. We made it home around 12:15 and were pretty happy to see our beds. So that gets us caught up to today. And just in the nick of time too, because we have many more adventures planned for this weekend. Until next time I hope you can enjoy your own personal victories, what ever they are.